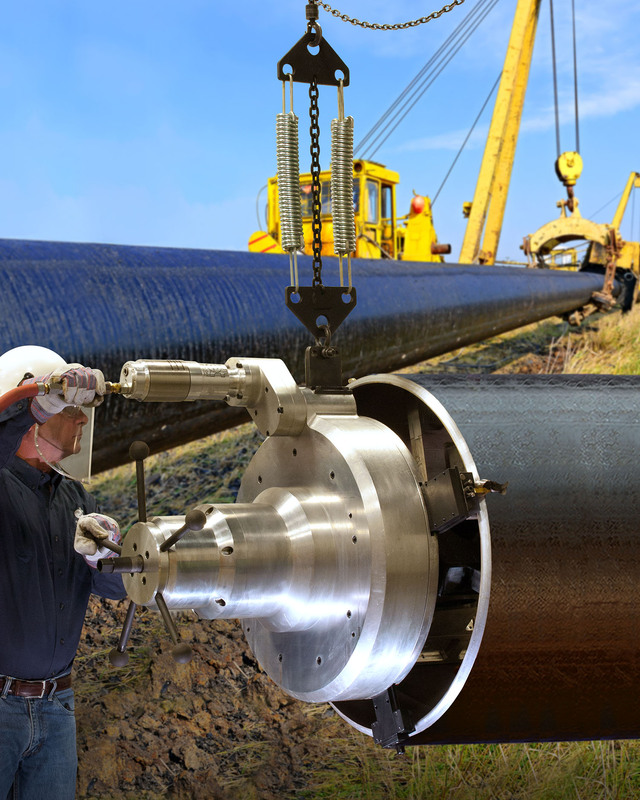 A portable pipe beveling tool that lets one person perform end preps on large pipe used for oil & gas pipelines and process steam lines to help produce precision welds is available from Esco Tool of Holliston, Massachusetts. The Terminator MILLHOG® Pipe Beveling Tool features an adjustable tool holder that indexes and locks for easy setup and has a dual spring safety hanger which facilitates alignment on pipe from 8-5/8” I.D. up to 36” O.D. Allowing one person to setup, align, and machine large pipe ends, this pipe machining tool can bevel, face, and bore simultaneously to create precision end preps that are the foundation for producing precision welds. Easy to maneuver, the Terminator MILLHOG® Pipe Beveling Tool rigidly clamps to the I.D. and has a tracker to compensate for variations in wall thickness and a precision feed control to advance into the pipe. Equipped with user-selectable formed TiN coated tool bits, it comes with a 5 HP pneumatic motor or an optional hydraulic motor and does not require cutting fluids. The Terminator MILLHOG® Welding End Prep Tool is priced from $47,995.00 and is available for rent in the continental U.S.A.